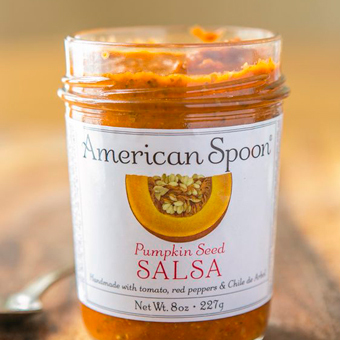 A must have for fall entertaining, this beautifully balanced handmade salsa features tiny chunks of toasted pumpkin seeds and flecks of Chile de Arbol swimming in a blend of fresh tomatoes and red bell peppers. 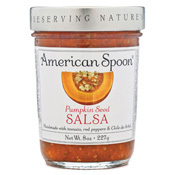 The medium intensity makes this a favorite for snacking straight from the jar and versatile enough to complement a variety of dishes, Nachos, tacos and egg dishes all get a lift when paired with this award-winning salsa! Like most good things, American Spoon began with dreams. For Justin Rashid, it was the dream of a livelihood harvesting the bounty of the farms and woodlands of Northern Michigan. For Chef Larry Forgione, it was the dream of gathering the harvests and traditions of America's diverse regions into a distinctively American cuisine. Their dreams converged in 1979 when Justin began picking Michigan's wild morel mushrooms and shipping them to New York for Larry's menu. Soon, with Larry's encouragement, Justin was gathering wild mushrooms, wild nuts, berries, wild greens and purveying farm-raised vegetables and game for Larry's and other restaurants around the country. In 1981 Larry and Justin shared a new dream: to produce the finest fruit preserves in the world from Michigan fruit. Larry developed an original recipe that would capture the essences of the fruit, Justin selected superb varieties of Northern fruits worthy of the effort, a kitchen was furnished with large copper kettles and wooden paddles, and American Spoon was born. Their first preserves, made from Early Glow strawberries, were soft, succulent and filled with halved berries. They were described as "Spoon Preserves" because they were more suited to spooning than spreading with a knife. 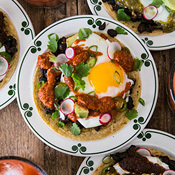 The name became permanent and so did the concept of putting as much fruit and honest flavor into every recipe, a concept that has inspired a continually expanding line of delicious products.